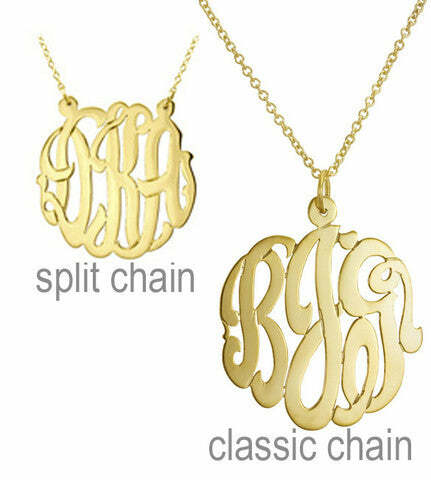 Hand Cut Monogram Necklaces are one of the hottest trends in jewelry. It is a great way to celebrate you! No two are alike. Choose from five sizes in gold vermeil (sterling silver dipped in 14K gold) or 14kt yellow gold. XSmall measures 5/8" and is close to the size of a nickel. Small measures 7/8" and is close to the size of a quarter. Medium measures 1-1/4" and is close to the size of a silver dollar. Large measures 1-1/2". XLarge measures 2". Choose a 16" or 18" chain, pendant style or split chain style.